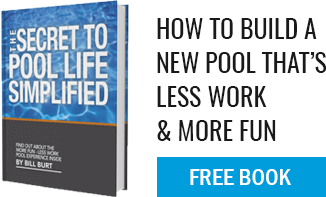 A typical pool can take anywhere from 6-8 weeks to build. That is almost three months of enduring a massive hole in your backyard before you can even imagine first dipping a toe into that cool, crystal clear water. This is a fairly brisk timeline to expect considering the inevitable setbacks from inclement weather, equipment failure, permitting hurtles, and arguments with your neighbor because the backhoe ran over their lilies. This is why it is important to strategically assess what time of year to begin a pool construction project before you jump in. First of all, when deciding upon a timeline, you should consider what is best for you and your family. A pool and the surrounding landscaping are typically executed at best in the springtime. This that it’s important to make sure that every detail is considered and completed in time for that first warm day to host a BBQ. Secondly (and maybe most importantly from a builders perspective), consider what is best for your pool construction “process”. In the spring, they will likely have a backlog of work (they have hopefully been signing up people all winter and unable to do much work due to the snow/ice issues. The spring weather is more unpredictable and the soil is typically wetter from winter snow melt and frequent spring showers. These uncertain conditions can lead to setbacks and delays that cannot necessarily be anticipated in the very early spring. Your pool is the only one that matters, but understanding that the contractor has more than one to worry about is important for you to avoid frustration. Beginning excavation and heavy dirt-work in the fall however, means your builder is able to take advantage of the milder temperatures and often drier, more workable soil conditions. Excavation can also be a bit of a traumatic visual experience for your family, with your yard temporarily transformed into a giant open dirt pit. If this portion is scheduled in late autumn, your family can chalk it up to the general grey dreariness of the season instead of interrupting a vibrant outdoor season. Also, it’s good to remember that everything is temporary, especially the first phase of building a pool! As winter sets in, the heavy work will be completed and the loose, freshly excavated soil will have time to settle and self-compact over the winter. This additional time, when little activity will be occurring in the back yard, will can be utilized for material selections and landscaping plans. Finally, with spring just around the corner, plumbing and electric is installed, followed by tile and coping, then your deck and the surrounding landscaping is installed and planted. With time and planning considered by you and your builder, a timeline involving the weather and its seasons allows you to welcome your new pool just as the warm weather breaks. Instead of hoping to have the pool started “first in the spring”, your pool will be complete long before Memorial Day. Now with nothing left to do but erase those memories of that giant hoe ripping into your once beautiful backyard, get the family outside, fire up that grill, and invite your builder and their crew over for a cold drink.